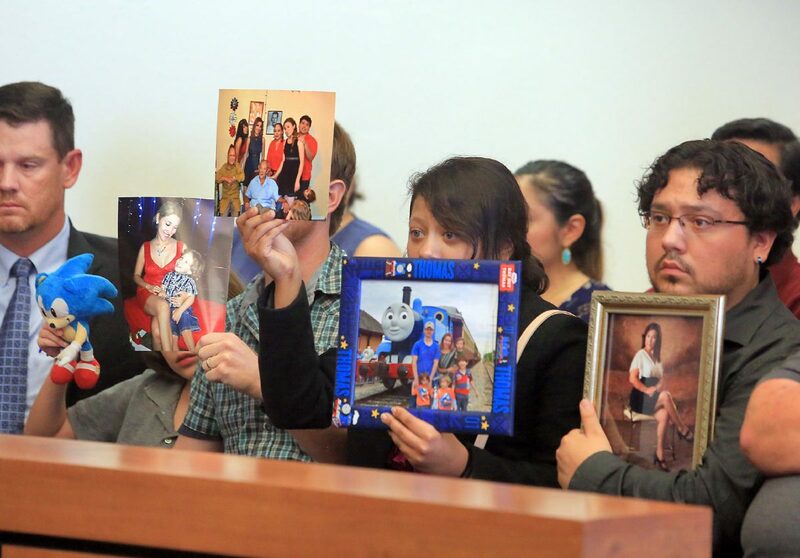 Family members hold up pictures of the victims in the courtroom as Luis Javier Gonzalez listens to charges of intoxication manslaughter and intoxication assault, in relation to a two-vehicle crash that left three people dead on Monte Cristo Road Aug. 8, during his arraignment at the Edinburg Municipal Court Wednesday, Aug. 15, 2018, in Edinburg. 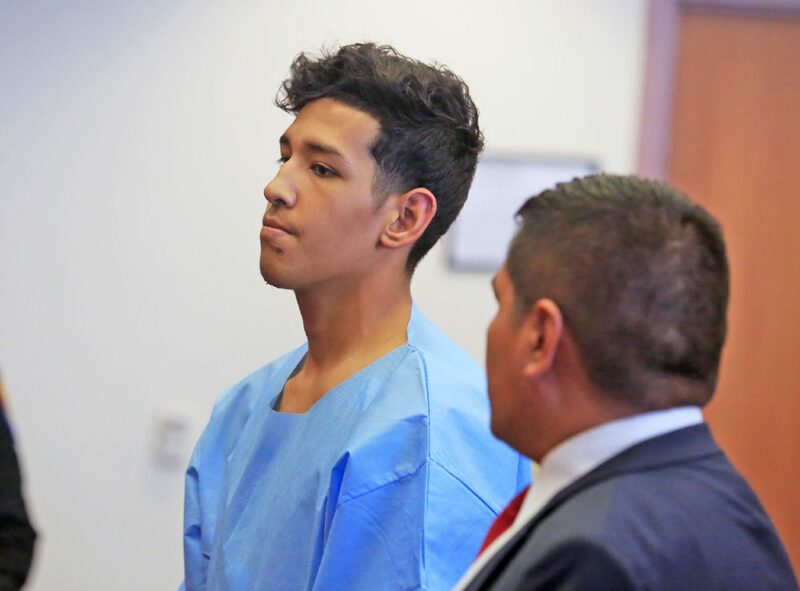 EDINBURG — A 19-year-old was arraigned Wednesday on three counts of intoxicated manslaughter for his role in an Aug. 9 head-on collision that killed a grandmother, mother and toddler. The victims’ family members packed the Edinburg Municipal Courtroom Wednesday, some holding photos of their loved ones, to watch Luis Javier Gonzalez hear the charges against him, which also include one count of intoxication assault. Among those in attendance were Marci Lou Powell’s husband and 9-year-old son, who sat feet away from the young man charged with killing Powell, 33; their youngest son, 3-year-old Joshua Devin Powell; and Powell’s mother, 55-year-old Maria Isabel De La Garza. Powell’s 5-year-old twin boys remained outside the courtroom during the arraignment. Another family member who was in the vehicle at the time of the crash remained in the hospital as of Wednesday afternoon, according to Lt. Oscar Treviño, spokesman for the Edinburg Police Department. 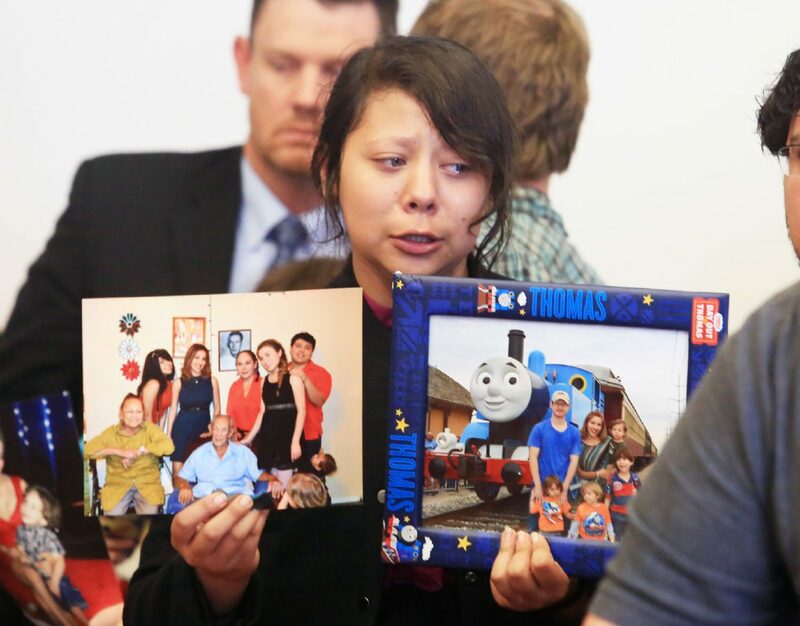 A family member of three who died in a fatal crash holds up photos of the victims as she walks from the courtroom in tears at the Edinburg Municipal Court Wednesday, Aug. 15, 2018, in Edinburg. This occurred after the arraignment of Luis Javier Gonzalez, who has been charged in a two-vehicle crash that cost the victims their lives on Monte Cristo Road Aug. 8. Luis Javier Gonzalez listens to charges of intoxication manslaughter and intoxication assault, in relation to a two-vehicle crash that left three people dead on Monte Cristo Road Aug. 8, during his arraignment at the Edinburg Municipal Court Wednesday, Aug. 15, 2018, in Edinburg. Gonzalez lost control of his Chevrolet Malibu at approximately 9:26 p.m. Aug. 9 and veered into oncoming traffic in the 300 block of East Monte Cristo Road, striking head on the Chevrolet Sonic carrying the four family members, Treviño said. Gonzalez is suspected of being under the influence of Xanax at the time of the collision, per his own admission to police, Treviño added. Neither police nor the municipal court have released the probable cause affidavit tied to Gonzalez’s arrest and charges. Before Municipal Judge Toribio “Terry” Palacios set Gonzalez’s bond at a combined $1.7 million on all four charges, Gonzalez’s attorney Jose Antonio Solis asked the judge to consider that Gonzalez is a lifelong Edinburg resident, a 2017 graduate of Edinburg North High School and has no criminal history. Gonzalez remained composed during the brief arraignment and did not look at the victims’ family and friends in the courtroom. He was booked into the Hidalgo County jail following Wednesday’s court proceeding. He faces up to 20 years in prison on the second-degree felony intoxication manslaughter charge and up to 10 years on the third degree intoxication assault charge, if convicted.